It was originally for personal consumption, but later on I started using it in my cafe, e.g. in cakes, smoothies, sauces and dressings. At home, I like having it with granola for breakfast, and for a healthy and quick snack or dessert, I mix it with frozen berries drizzled with honey. Even my not-so-health-conscious husband loves it. When I feel like pampering myself, I make a face mask by mixing yogurt, finely ground oats, and honey. I swear it’s the best facial mask ever! It manages to tighten pores while moisturising and hydrating the skin at the same time. To me at least, I find that my skin looks brighter and more supple after a yogurt mask. 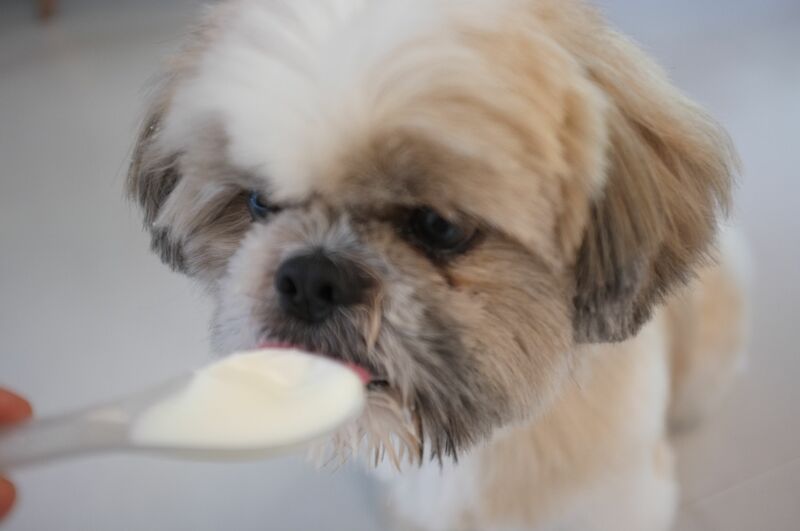 Even my shi-tzu, Chewie, loves yogurt. He eagerly licks it as if it were ice cream. I started giving him a spoonful of yogurt once a day after a friend told me that her vet recommended it for a healthier gut. With the way I just love anything yogurt and having it around as a staple, I don’t know why I’ve waited this long to make yogurt soap. But thanks to Cee of Oil & Butter Soap , I was inspired to finally go for it. 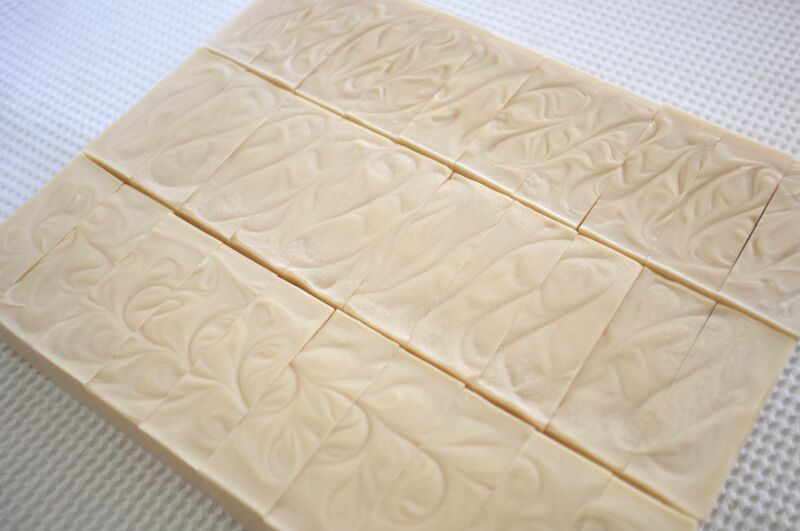 Check out her gorgeous and elegant Sunflower Yogurt Soap. After attempting to have colors and designs in my soaps the past couple of months, sometimes succeeding but mostly barely so, this time I wanted something plain and unadorned. 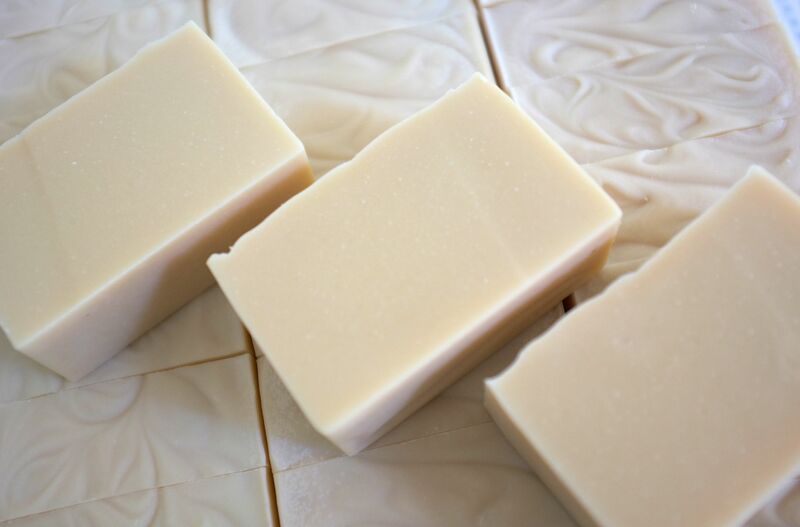 Since I like gelling my soaps, I just added a small amount of titanium dioxide to counter some of the discoloration, but basically I just wanted it to look natural – a bit creamy and off-white. I normally scent my soaps at 4 – 5% ppo, but for these I just wanted a background scent, so I went down to a bit less than 3%. Soaping with yogurt is quite easy. I did not even bother freezing it, as is usually the case when using dairy in soap. I just started master batching my lye solution (bookmarked for a future post) so I simply blended the yogurt with the oils before adding in the lye solution. Yogurt itself does not accelerate trace, so it all depends on your fragrance or essential oils. After cutting the soaps, I noticed a sour-ish smell but that went away after a day or so. I can’t wait to try these soaps! If it’s any indication, I washed my hands with the scraped bits left on the liner and the lather was just incredible! This entry was posted in Cold Process, Perfumed Soap and tagged Cold Process, Yogurt on August 18, 2013 by soapjam. Thank you, Natalia! I know I should wait but i was too excited so I used a 9-day old bar last night. It feels so creamy, love it! Oh my gosh, how adorable is Chewie!!! Thanks so much for the shout-out Silvia, I really like the way you approached this, by adding the yogurt directly to the oils first and then adding the lye. I’m really looking forward to your post about how to masterbatch lye solutions, I would love to learn how to do this. Oh, and your soaps turned out gorgeous, so creamy! Hi Cee! Thank you for your comment and happy to hear you find Chewie adorable. 🙂 It’s my pleasure to link back to your site. Your yogurt post was my inspiration. I’ve never liked mixing water substitutes like aloe vera, vegetable juices and milk directly with the NaOH bec I feel sorry that they have to be subjected to such brutal environment. I like to mix them with the oils first so it’s “gentler”, but there’s probably no basis to this. Will try to do the post on master batching with photos in the next couple of weeks. 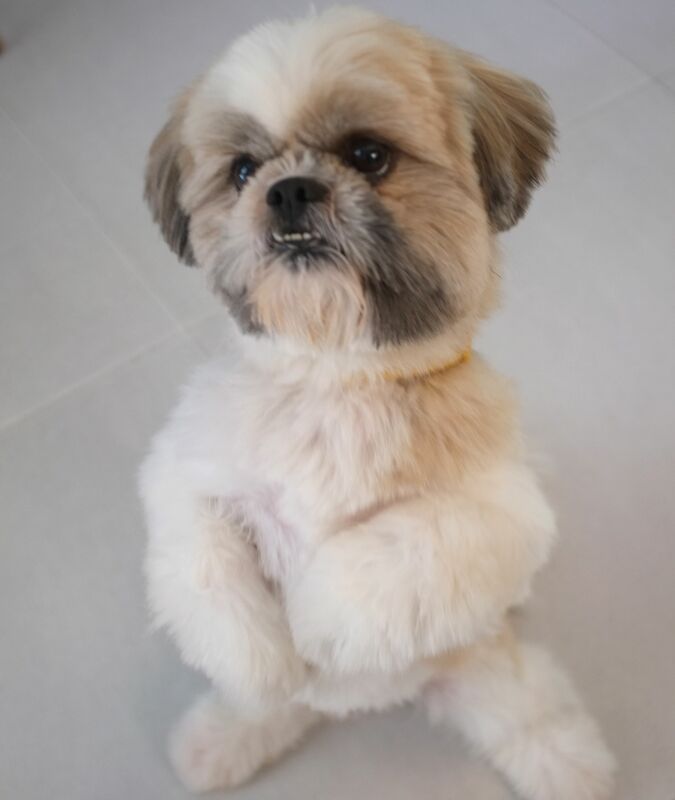 How cute is Chewie?!!! What a sweetie! 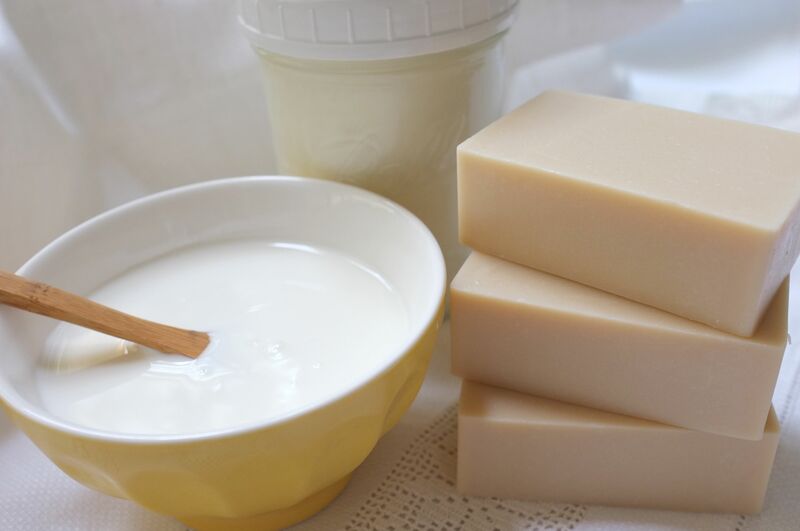 Great idea to add the yoghurt to the oils – I’ve never tried making yoghurt soap (yet!) but I made goat’s milk soap once – it didn’t look anywhere near as lovely and creamy as yours. Thank you, Vicki! I stick blend the oil and yogurt before adding the lye. Give it a try, I’m sure you’ll love yogurt soap! You totally inspired me to try yogurt in my soap. I’m in love!!! You can replace all of the water in your recipe with yogurt. Since I master batch my lye solution, I end up with half water and half yogurt. Good luck on your yogurt soap! Hello! I tried adding goat yogurt today to my soap (same proportion as you do), but it did accelerate trace in my case. I added it at emulsion. I think my mistake may have been that it was colder than my oil/lye mix. I noticed that uneven temperatures may accelerate trace. I managed to finish it according to my plan. I hope it will be nice and gentle to the skin! And, if I may… What do you say you do not gel your yogurt soaps? To keep them naturally white? Hi Valerie. I have noticed that having the yogurt and oils at a similar temperature produces the best results. I also stick blend the yogurt and oils until smooth and homogenous – before adding the lye. I have not noticed that yogurt accelerates trace. I gel all my soaps and their natural colour is off-white. If I want to make them whiter, I add some titanium dioxide. Thanks for visiting Osiris. I rarely rebatch, and when I do, I just eyeball the extra liquid. The amount of liquid will also depend on how young or old your soap is. It your soap is new and is still soft when you grate it, you may just need to add a tablespoon or so of yogurt. Silvia your reply help me a lot! my soap was very young and soft so for 2 pounds of grated soap I add 2 to 3 tbs. of yogurt and about 15 drops of EO It turn out very creamy and nice. Silvia, Thank you for inspiring me here in hot St Louis, Missouri . We are under the same sky though, so its as if you are close. I follow you with contentment and smiles…you are so kind and happy in your postings. How do you find the time to do all of these !!! I am amazed at your organization and energy … and your beautiful creativity. Hi, I have never made a yogurt soap before and would love to make one. I am confused on how to use the yogurt and water and lye . If I make a 1000g batch of soap and lye used is 142g and water used is 300g how much yogurt can I use and do I discount the water and replace it with the yogurt? Hi Deborah! If you wish to replace all of the water with yogurt, you would need to freeze the yogurt first, like you would a 100% milk soap. I master batch my lye, so I only use 50% yogurt. In this case, no need to freeze the yogurt- just mix it with the oils before adding the lye solution. You may or may not use a water discount, it’s your discretion. Hope this helps. I tried my yogurt soap yesterday!! The best soap ever!! Creamy and so moisturizing than any soaps I have made! It’s even more moisturizing than my bastille soap!